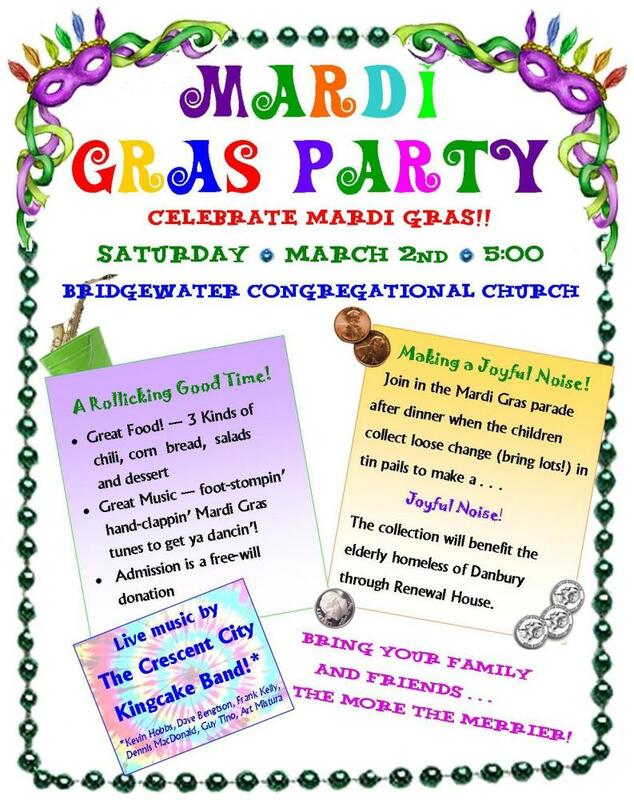 Our annual Mardi Gras celebration will be on Saturday, March 2nd, at 5:00! It’s a fun event for the whole family, with fabulous music by our very own Crescent City Kingcake Band*, three kinds of delectable chili, a variety of cornbreads, salad and dessert. our Mardi Gras “parade,” the children will carry tin pails to collect your loose change, making a “joyful noise”! Free-will donations at the buffet are also welcome! great cause. All proceeds will be donated to Renewal House in Danbury, which provides housing, support and services for the elderly homeless.